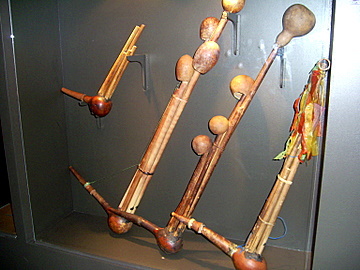 Tribal musical instruments feature pictures of rare and unusual musical instruments of the hill tribes in northern Thailand and the neighbouring countries with briefs on their history, culture and the role of music in their lives. The Golden Triangle, the area covering northern Thailand, eastern Myanmar and western Laos, is home to some of the world’s oldest civilizations from China and Tibet. 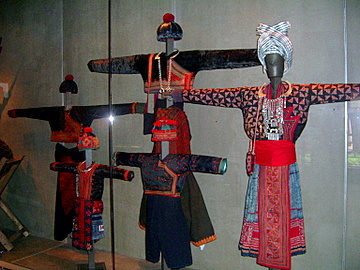 The pictures and write-up on these tribal musical instruments are based on the exhibition “Songs of Memory – Traditional Music of the Golden Triangle” by Victoria Vorreiter who has done intensive research on the lives, customs, ceremonial clothing and musical instruments of the Akha, Hmong, Karen, Lahu, Lisu and Mien people. Being a violist and music teacher by profession, Victoria has the ear and knowledge of sounds to appreciate and share with us the finer points of these musical instruments. Victoria has also written a book of the same name and produced a CD of the music. 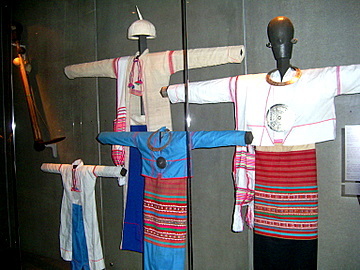 The rare exhibits of musical instruments and clothing of these tribes are on display at the Jim Thompson Art Center in the Jim Thompson House Bangkok from 24 April – 23 July 2009. Admission was free. 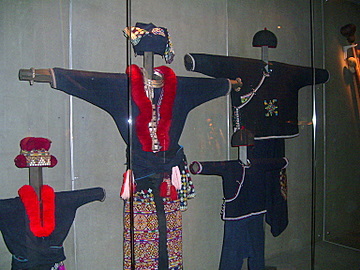 The six major tribes featured here, Akha, Hmong, Karen, Lahu, Lisu and Mien, are agrarian and animist societies in which music takes on a special importance. Most of us think of music merely as a form of recreation and relaxation. For these tribal societies, music is a heritage of expression through a variety of musical instruments. Music is an extension of speech. There’s a musical instrument for every facet of life, festivals, ceremonies, for every occasion. 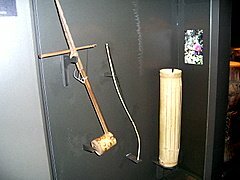 The origins and pictures of these tribal musical instruments of the various tribes are listed below in order of their presentation at the exhibition. The Karen originated from the Gobi Desert in Mongolia. They later moved to Tibet, Yunan China and then to Myanmar and north-west Thailand. They have an array of musical sounds and styles expressed through a variety of musical instruments. 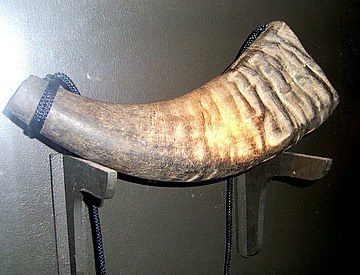 Buffalo horns are used during festivals, courting and for announcing ceremonies. 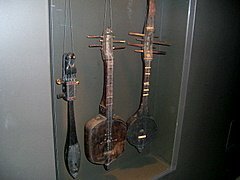 The three and four string lutes, one string fiddle and the eight string tube zither are played during courting and festivals. 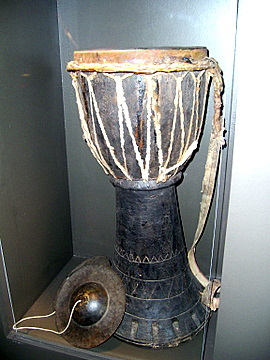 These drums are hung around the waist and played during festivals and weddings. The eight string arched harp is slung around the shoulders and held to the body like a guitar. Played during courting to the accompaniment of singing, it’s a joy to listen to. 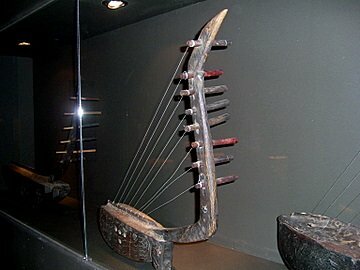 I had the chance to hear this instrument on the opening night; the singer sang and played the harp as backing. Although I couldn’t understand a word, the rhythm and melody sounded so much like a western folk song. The Lisu are natives of Tibet where they still live. Some have migrated to parts of India and western China before moving to Myanmar and Thailand. 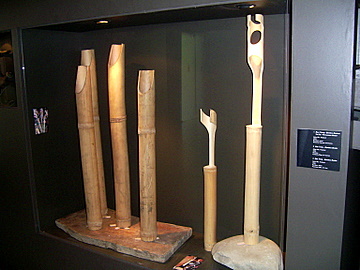 Music plays a simple yet vital role in courting and these bamboo flutes serve just that purpose. 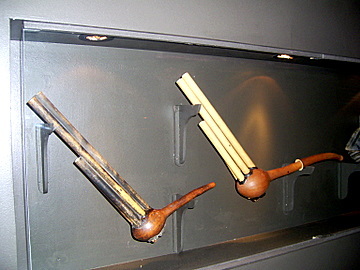 These musical instruments with an unusual shape are reed pipes. 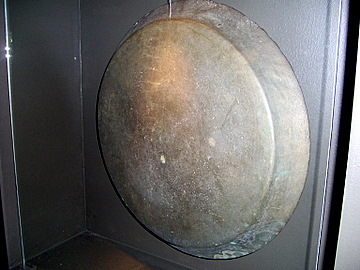 The bronze gong is sounded during holy days and festivals. 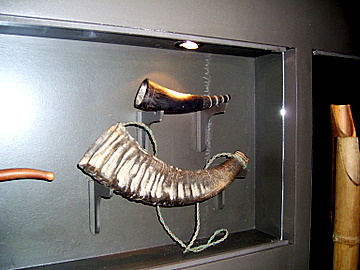 To summon villagers, the buffalo horn is blown. 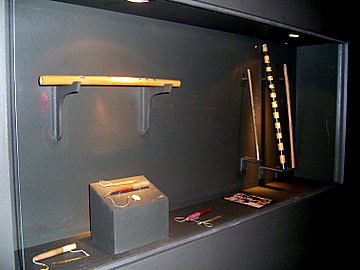 These apparently simple strips of wood are mouth harps played during courting. 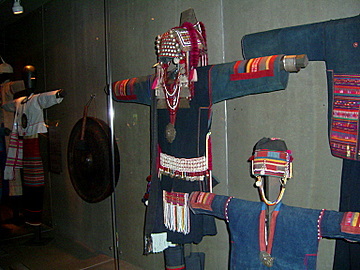 The Ahka have their origins in Mongolia before moving to Szechuan and Yunan provinces in China. 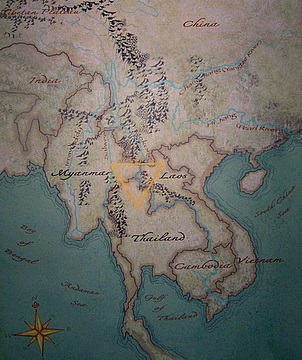 In the mid 19th century they migrated to the Golden Triangle area. Their music is represented in a variety of wind, string and percussion instruments. Music embodies their tradition, culture and history. Every facet of life is recounted in music, harvest, hunt, phases of life and seasons. 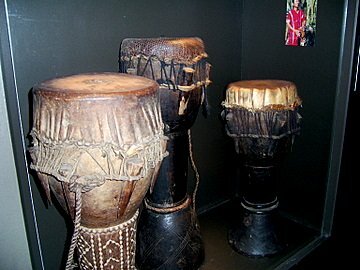 Drums are made from hard wood and buffalo hide. 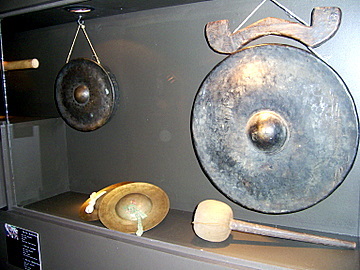 The bronze gong and cymbals are used to call spirits during festivals. 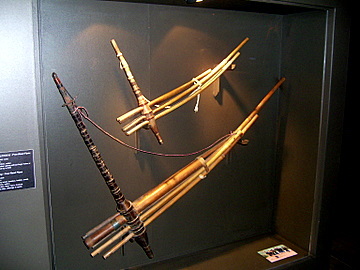 During courting, the soft and melodious bamboo flutes are played. You will hear these free reed treble pipes at New Year dances. 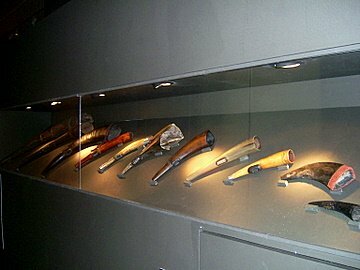 The buffalo horn will be heard when it’s time for the hunt. 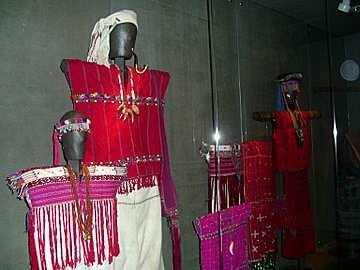 The Lahu are from the Tibetan Plateau the highest place in the world. Later they migrated to southern China and in recent centuries moved down to Myanmar, Laos, Vietnam and Thailand. 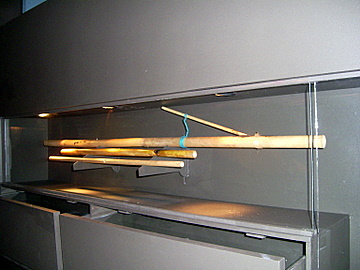 Reed pipes, gongs and chants are used by the Lahu to reach gods and spirits. For centuries they have played music to heal, seduce, unite, lament, appease and rejoice. Music is a medium of expression of emotion. 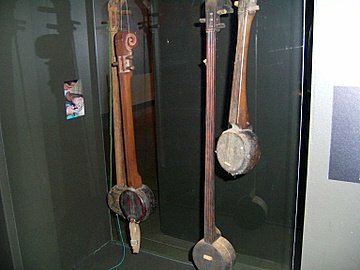 The three and five string lutes, made from wood and lizard skin, are played with a plectrum made from buffalo horn. 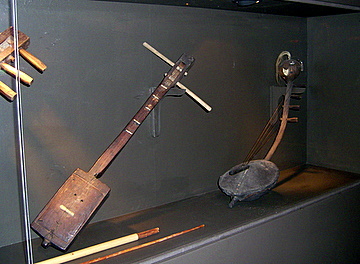 These musical instruments can be heard during the New Year and courting. 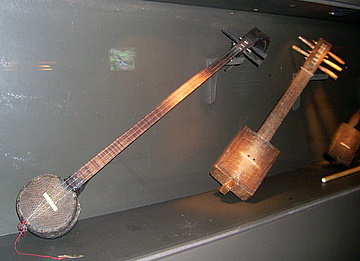 The spike fiddle made from wood and metal is played with a pinewood bow during festivals. 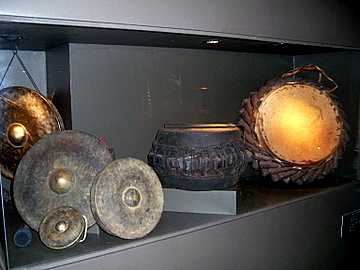 Bronze cymbals and drums made from hard wood and buffalo hide can be heard during festivals. 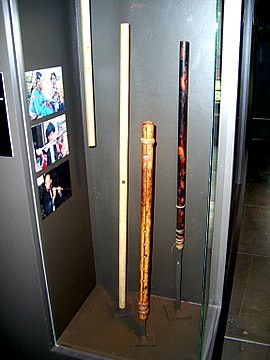 The array of free reed pipes give a range of sounds, treble, contrabass, bass, tenor for New Year dancing, courting, healing ceremonies and sacred rituals. When it comes to courting your heart’s desire, there’s nothing like the flute. 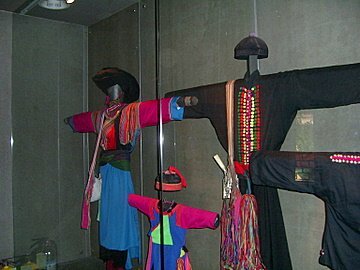 The Mien preserve their history and traditions in song which tells of migration through Central Asia possibly Mongolia before settling south of the Yangtze River 2,000 years ago. Their songs tell of the centuries of prosperity. In the 14th and 15th centuries the Mien migrated to southern China in Hunan, Guangdong, Guangxi, Yunan and Guizhou provinces where many till today. They later moved to North Vietnam, Laos and Thailand. 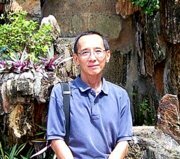 Their animism is blended with Taoism, a result of Chinese influence. 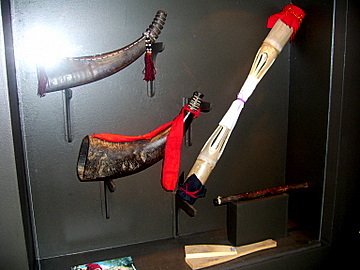 The buffalo horn is blown to summon to spirits to sacred ceremonies, the bamboo drum, the end blown flute and wooden clappers are for healing and ancestral rites. Another musical instrument for courting is the simple wooden mouth harp. 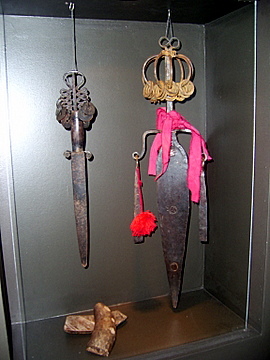 At major ceremonies iron swords are used to ward off evil spirits and bamboo blocks serve to sermon spirits. Four bronze gongs, wooden two sided drum made from cowhide metal and rope for sacred ceremonies and weddings. Songs and legends of the Hmong tell of the motherland with icy terrain and harsh winters. Originally from Mongolia, Siberia and Tibet, the Hmong migrated to the Yellow River and settled in lower Yangtze in southern China. In the 1700s they moved to South East Asia. Their music is an extension of speech, a sacred medium of song, poetry and prayer made all the more melodious by their tonal language. 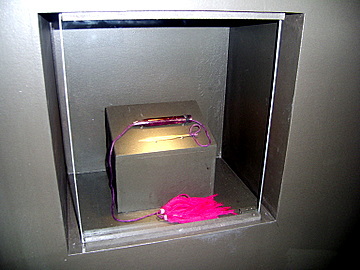 Musical instruments like mouth harps, flutes, strings and reeds provide a musical extension of their language. Musical instruments take on magical and sacred importance. Music is life. 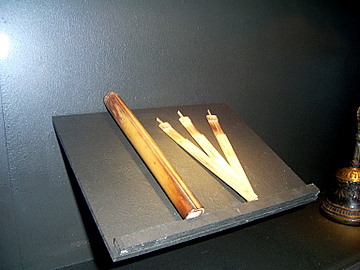 Free reed pipes played during funeral rites, ancestral rites and offerings to spirits. 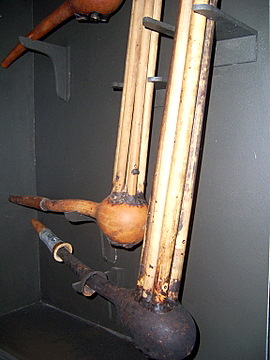 This is how these pipes are played. 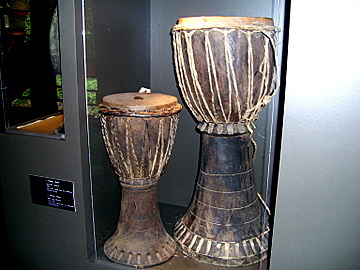 And with that we end our journey through the Jim Thompson Art Centre on displays of tribal musical instruments. We hope that this introduction to tribal music will open a window of interest into a people with a long history and tradition and a rich culture. 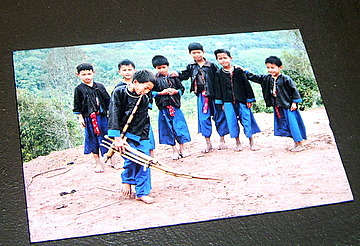 As at 3 May 2009, there are an estimated 900,000 hill tribes people in Thailand. Of these, only 40% have got Thai citizenship. Without citizenship rights they are deprived of public housing, health care and basic education for their children. We hope the day will come when they take their rightful place in society. When that happy day arrives, we can be sure it will be recorded in song. My thanks to Victoria Vorreiter for introducing me to the beauty and wonders of tribal culture and music through her exhibition. For more on Victoria’s work, please see Music and the Cycles of Life. I’m also grateful to Susan Stem, who assisted in this project, for her invitation to this very interesting exhibition. Susan’s specialty is in Asian tribal art, Tribal Trappings.